Hate long lines? No time to go the nearest Globe center to pay your bills? Is your online banking system is offline? 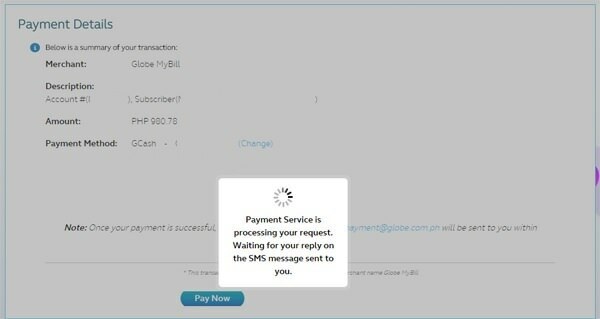 Go ahead and pay your bills online via https://www.globe.com.ph/paybill. It’s secure and you get an an OR (Official Receipt) within 24 hours, or, for corporate accounts, you can request for one. Go to: https://www.globe.com.ph/paybill. You can pay your Postpaid Mobile, Internet only or Bundled accounts . In this scenario, I am paying my postpaid account using GCash. I only need to enter 4 details: (1) my mobile phone number, (2) the email address where I want to receive my Official Receipt, (3) My mode of payment, and (4) the amount I want to pay. In addition to paying via credit card, you can actually pay using a debit card or your ATM card so as long as your card has a MasterCard, Visa or American Express logo. Once you’ve verified that the details you entered are correct, click on “Proceed with GCash payment”. You will then be allowed to verify the details of the account you are paying for. I like this page since it can show me if I entered the wrong account number or the wrong GCash mobile number. Click on “Pay Now”. You will get an alert that the payment is currently being processed. And since I paid via GCash, I received 2 SMS: (1) One to request for your MPIN and (2) to verify charged amount and balance. And that’s it. 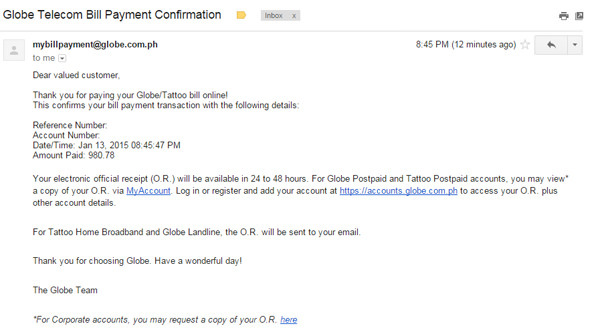 You’ll get the confirmation page and a confirmation email for the transaction.